In the materials that I’m working with in my research the name of John T. Lewis is inseparable from the churches in Birmingham. That is as it should be. Lewis spent sixty years in the Magic City and deserves every bit of the credit he gets for the number and strength of the churches in that city. But he was not without help. One of the most fascinating aspects of this research has been uncovering the stories of Lewis’ helpers in the work in Birmingham. I say uncovering because the story I’d like to tell here is largely absent from He Looked for a City and I’ve had to piece it together from several other sources. That said, what appears below is more of a dossier than a biography proper. I’ve tried to make it as readable as possible, though. William C. Graves (1886-1946) was born in Alabama. In his own narrative of his early life, included in S. H. Hall’s Sixty Years in the Pulpit (1955), Graves recounts that he was raised in Methodist and Presbyterian settings. By the time he had entered his 20s, he had gone to Atlanta. There he was baptized by S. H. Hall in East Point (an Atlanta suburb) in May 1912. 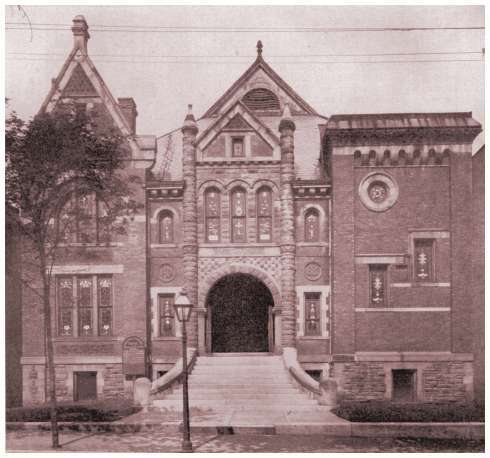 Presumably at the encouragement of Hall, he entered the Nashville Bible School in the fall of 1914. He graduated in the spring of 1917. After graduation, he was off to Dalton, Ga., for a brief time before returning to Atlanta. The date isn’t exactly clear, but Hall indicates that Graves had left Atlanta for Birmingham by the summer of 1920 (“Georgia and the Far Southern Field.” GA 62.33 [August 12, 1920]: 791). 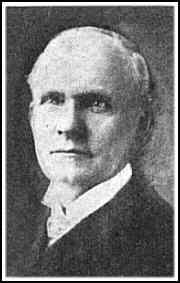 In the Advocate, Hall reports that R. L. Harwell, one of the West End (Atlanta) elders, had been in Birmingham over a recent weekend and had worshipped at West End (Birmingham) while in town. Graves happened to be preaching that day and Harwell took a glowing report of the day back to Atlanta with him. It’s clear that it gave Hall great pleasure to relate this: Graves was clearly a student of whom he was very proud. So, Graves was preaching at least occasionally at West End very soon after his arrival in Birmingham, perhaps on Sundays when C. M. Pullias was away. The pace of his work only increases thereafter. In 1921, we find a report in the Gospel Advance (Price Billingsley’s monthly out of McMinnville, Tenn.) indicating that Graves is going to be working full-time with the church in Gadsden, northeast of Birmingham. It’s unclear what happened there; I’ve found no other references to it. Castleberry’s first reference (of two) to Graves comes from this early period: “The work among the black people in the area was started in Ensley by W. C. Graves. [He] supported himself as a representative of the Southern Bell Telephone Company” (He Looked for a City, pg. 6). The relationships are never made explicit, but it is reasonable to suppose that Graves became familiar with Marshall Keeble’s work through S. H. Hall and through his time in Nashville. At any rate, when Keeble first came to Birmingham in 1921, Graves played a prominent role in that work (Hall, Sixty Years in the Pulpit, pg. 38). In his first Birmingham meeting that summer, Keeble baptized 45 people, who became the nucleus of the “New” Church of Christ in Ensley. Keeble returned numerous times over the next few years to hold protracted meetings and to work with this congregation, sometimes staying in Birmingham for over a month at a time. Between visits by Keeble, Graves and James H. Davis (who later served as a deacon and elder at West End) preached and taught for the fledgling congregation. Graves’ racial attitudes are hard to speak to definitively. 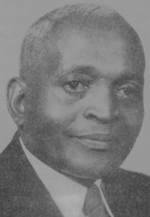 He enthusiastically believed in evangelizing Birmingham’s African-American population, which was quite a bit more than could be said for some of his brethren. Moreover, he clearly cared for the members of Keeble’s fledgling Birmingham church. That said, some of his comments will undoubtedly sound backhanded or patronizing to our contemporary ears. Consider these remarks from Graves’ pen in 1923: “Let me say a word about Brother Keeble. He preaches the gospel of Christ and knows how to behave himself. That’s enough” (W. C. Graves. “The Work in Birmingham Among the Colored Folks.” GA 65.41 [October 11, 1923]: 994-95). In this, I think we could fairly say that he is a product of his time and place. Birmingham in this period has been called “the most segregated city in America.” In some ways it is surprising that Graves crossed as many lines as he did. Whatever we make of Graves’ stint in Gadsden, he is definitely back in Birmingham to stay by 1923. In the fall of that year, he established a mission congregation in Bessemer. Several members of West End, including O. B. Anthony, came along to help support this work. By 1924, Graves had started Truth in Love, a small four-page weekly publication. Truth in Love was part evangelism/teaching tool and part newsletter for the churches in the Birmingham district. JTL wrote extensively for it throughout the 1920s. It ultimately went through two iterations before Graves fell ill and sold it to Marion Davis and Gus Nichols in 1942, at which time the paper left Birmingham and ceased to be locally focused. As the decade progresses, Graves’ fingerprints can be found on a number of Birmingham-area congregations. Truth in Love (quoted by Castleberry) indicates that he preached at North Lewisburg (later Fultondale) in 1926. During that same year — in the uncertain interim between H. F. Pendergrass and J. W. Shepherd at West End — he did fill-in preaching. The first issue of the Gospel Advocate for 1928 finds him preaching at Parkview (the forerunner of the Berney Points church). We lose the trail for a bit in the early 1930s. 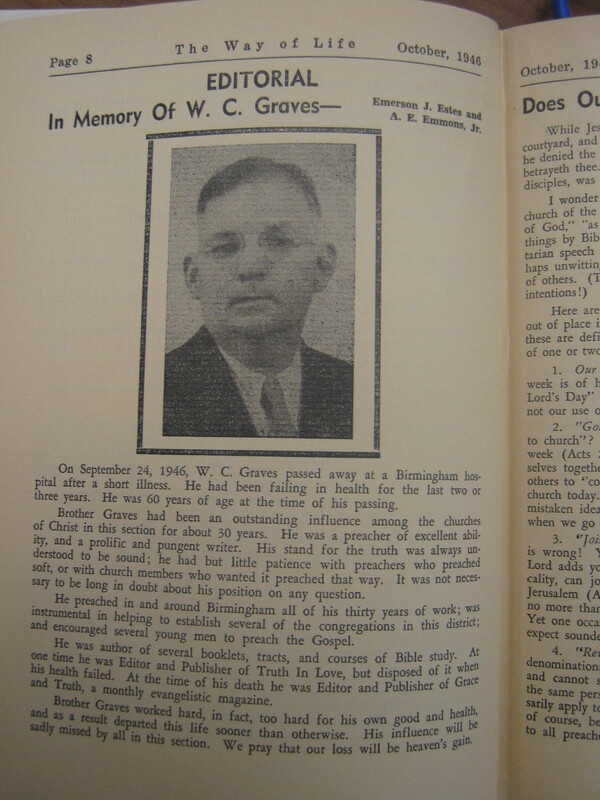 But by 1936, Graves was preaching for the Tarrant City church. 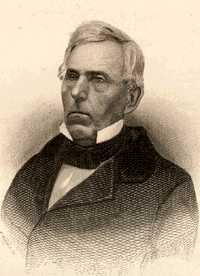 Castleberry’s other reference to Graves comes here: While in Tarrant, he debated a Primitive Baptist minister with JTL serving as his moderator. Reportedly, Graves got so flustered in the course of the debate that Lewis had to finish the debate (He Looked for a City, pp. 203-204). In late 1936, Graves introduced a “reboot” of Truth in Love. It’s unclear how long the first version had been out of print by this point. Nevertheless, the new TIL was larger (8 pp.) and featured a mix of Birmingham and national names among the writers and editorial staff. (In 1937, the editors were Gardner Hall, Jack Meyer, and Gus Nichols.) Graves was the publisher of this version of the journal, only writing infrequently. JTL, likewise, only rarely appears. After he sold TIL, Graves was still involved in other ventures. He ran a religious bookstore out of his house at 817 7th Street in Birmingham. (Ads can be found in several issues of TIL.) He’s listed as a staff writer for A. E. Emmons’ and Emerson Estes’ The Way of Life (published out of Birmingham from 1943-48) and also wrote extensively for Sound Doctrine, a journal published out of Montgomery in the early 1940s. Around 1942, Graves published what I believe to have been his only full-length book, Lessons on the Church of Christ. S. H. Hall had written a book of the same title (published by McQuiddy in 1916 when Graves was a student at NBS). Jack Meyer, in the intro to Graves’ book says: “The author, W. C. Graves, has been a resident and gospel preacher of Birmingham, Ala., for 22 years. He has assisted in establishing several congregations, has been the editor of a local gospel paper, is building a substantial business as a dealer in new and used religious books, has materially contributed to the growth of the gospel of Christ in this area, and is correspondingly well known” (pg. 4). The latest addition to the eldership of this congregation was made in the appointment of W. C. Graves a year or so ago. He has been a definite strength to the official force of the congregation. Brother Graves has been active in the growth of the church in the district for over thirty years, as a preacher, a leader, and an elder. Several churches have been “planted and watered” by him. No man in Birmingham exerts a wider and stronger influence, and though he has worked quietly, without sounding a trumpet before him, no one man has accomplished more good in that locality. For years Brother Graves has been an executive in the Southern Bell Telephone Company and has exerted a salutary influence as a respected citizen and business man as well as a Christian and a preacher. He possesses a fine knowledge of the Bible, is unblemished in character, amiable in disposition, and has always backed any preacher who will stand for the truth. I regard him as among the great men in the church and I esteem him as a personal friend. This was written, of course, after the fallout between Wallace and JTL. Is Wallace’s assertion that “no man in Birmingham exerts a wider and stronger influence, and though he has worked quietly, without sounding a trumpet before him, no one man has accomplished more good in that locality” a slap at Lewis? Who can say? At the time of his death, Graves was the editor and publisher of Grace and Truth, a monthly evangelistic magazine. After an extended period of illness, he died September 24, 1946. As I said, stories like Graves’ are really interesting to me. Here we have a man every bit as involved in the Birmingham work as JTL. If we knew nothing about him beyond what Castleberry recorded our picture of events in Birmingham would be greatly diminished. Does anyone out there have paper related to Graves and his work in Birmingham? Leave me a comment or send me an email.